Thank you for picking up the first edition of Public Health Broward, a newsletter from the Florida Department of Health in Broward County. You may ask, why should I read this? The answer is, we’re going to share a lot of information about public health, a subject that touches everyone’s lives every day – directly or indirectly. We will talk about healthy eating, exercise, families, preventing the spread of disease, avoiding chronic illnesses and more. Also, we’ll tell you a lot about what the Department of Health does in Broward, including some services you may not know about. 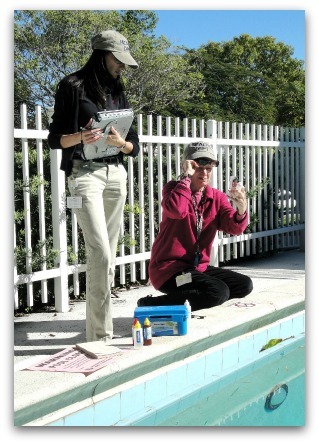 For example, do you know who inspects 4,400 public swimming pools in Broward, as spelled out in state law? YES, that’s us. Who provides dental care for children, regardless of income? YES, that’s us. Who inspects restaurants for cleanliness? NO, that’s not us. Public Health Broward will tell you about our Women, Infants and Children program (WIC), which teaches parents about good nutrition and helps families buy healthy food. You will read about our KidCare Outreach program, which helps families sign up children for low-cost health insurance. You will learn about the Department’s “silent” services – our epidemiology investigators who get to the bottom of outbreaks of communicable diseases, our sexually transmitted disease counselors who locate and inform people about STDs, and our emergency preparedness team that helps cope with disasters. My team and I continue to strive to meet the needs of our community, and I welcome your feedback about Public Health Broward. Every day, two dozen inspectors fan out across Broward County and make the world a little safer and healthier for all of us. The environmental health program at the Florida Department of Health in Broward County oversees and safeguards a large part of our surroundings – from the water we drink, to our beaches, public swimming pools, biomedical wastes and even theaters concession stands. DOH-Broward inspectors are out looking for substances, forces and conditions that may pose a risk to human health and well-being. Their work helps eliminate environmental hazards, prevent disease outbreaks and enforce health standards that protect the public. “Our inspectors will respond if you call in a complaint about a problem we oversee,” says Anthony Vomero, environmental administrator at the DOH-Broward. However, the department DOES NOT handle two of the most common complaints people make. DOH-Broward does not regulate mold in residences and buildings, and does not regulate or inspect restaurants. Restaurants and major food concessions fall under the Florida Department of Business and Professional Regulation. Drinking water – Inspect all public water systems in the county, and monitor their samples every month to make sure the water is free of bacteria, chemicals or other health hazards. The unit also inspects small private wells. If a hazard exists, DOH-Broward works with the operators and may fine them until the risk is eliminated. As a result, drinking water quality has improved in recent years. Sewage – Inspect all septic tanks in Broward to make sure they are installed correctly and not leaking. Beaches – Test ocean water at 13 beach locations in Broward, looking for contamination from bacteria. If inspectors find a violation, they post an advisory at the beach. The local government decides whether to halt swimming. 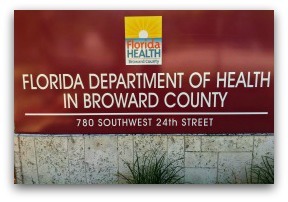 DOH-Broward notifies state environmental officials to address contamination. Public pools – Inspect about 4,400 swimming pools open to the public. These include pools run by local governments, schools, businesses and residential communities with more than 30 units. DOH-Broward DOES NOT oversee private pools. Sanitary nuisances – Investigate complaints about unsanitary conditions in public places, such as rodents, insects, sewage leaks and mosquito swarms in swimming pools. The unit may fine the responsible parties until they resolve the problem. The program DOES NOT oversee any other problems with abandoned swimming pools. That’s the job of local government code enforcement. Tattoo / body piercing – Inspect establishments that perform tattoos and body piercings, and monitor the people who do the work. Inspectors make sure they practice good hygiene, keep sanitary conditions and safely dispose of the waste. Tanning salons – Inspect tanning salons to make sure the machines work properly, the operators are certified and their methods are safe. Food Safety – Inspect kitchens and food handling methods at schools, group-living facilities and theaters with basic food concessions (limited to popcorn, wrapped food, hot dogs and nachos). DOH-Broward DOES NOT inspect retail food stores. That falls under the Department of Agriculture and Consumer Services. Mobile home and recreational vehicle parks – Inspect the parks, looking for problems on common property. The unit focuses on issues with garbage, pests and water and sewage systems. DOH-Broward DOES NOT handle issues with individual units. Radiation – Inspect and license all devices that give off radiation, including X-ray machines and cancer treatment systems at hospitals, imaging centers and physician offices. Inspectors make sure the devices work properly, are operated properly and that the waste is disposed properly. They also track down unlicensed machines. Biomedical waste – Inspect locations that generate potentially infectious biomedical waste, from hospitals to physician offices, clinics, testing labs and tattoo establishments. The program makes sure the waste is handled correctly and shipped to a permitted disposal facility. Group living facilities – Inspect, on a limited basis, assisted living facilities, group homes and foster homes, looking for safety issues with construction, operations and maintenance. The regulation of medical care at these facilities falls under the Florida Agency for Health Care Administration. For more information or to report a concern, visit Environmental Health or call 954-467-4700, ext. 4201. 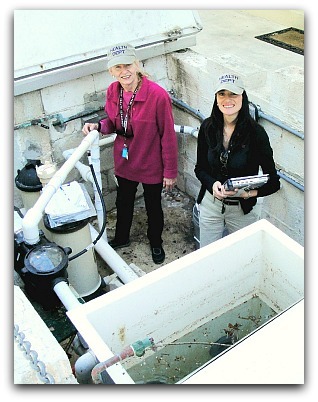 Photos : Environmental Specialists Pat Riley and Gina Diaz inspect a swimming pool pump (top) and test pool water. The newest ambassador for HIV and STD testing in Broward County weighs in at about 25,000 pounds, 10 feet tall and 40 feet long. 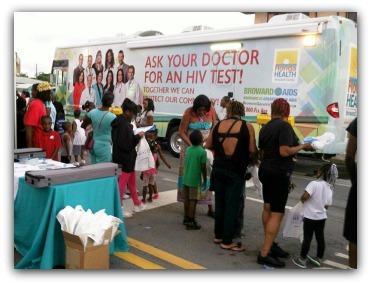 It’s the mobile testing vehicle of the Florida Department of Health in Broward County, a converted motorhome that travels throughout the community providing testing for HIV/AIDS and sexually transmitted diseases. Because DOH-Broward has been ramping up a sizable new campaign of promoting routine testing for HIV and STDs, it was time to give the RV a new look after seven years of service. “Everywhere it goes, it can remind people to get tested. The message is much stronger now,” says Candy Sims, public information officer at DOH-Broward. The new-look vehicle made its debut at Fort Lauderdale’s Light Up Sistrunk festival. About 2,000 adults, teens and children strolled past the RV, and 50 came inside to get tested. For HIV testing, the RV staff uses a finger-stick “rapid test.” STD testing involves a urine sample, mouth swab or finger-stick. “The tests are easy and give the person their results in a few minutes,” says Joshua Rodriguez, coordinator of the HIV/AIDS early intervention program. Increased HIV testing is a major part of the Broward Is Greater Than AIDS (BIGA) campaign, which DOH-Broward has been organizing with community partners since 2011. You may have seen BIGA messages on TV, Broward County Transit buses and sidewalk benches. BIGA urges residents, doctors and health professionals to test for HIV routinely, as part of medical visits. The RV carries a huge photo of “physician ambassadors” who support the routine-testing initiative. Keep watch for the VIP RV of HIV and STD. Find more information about testing or call 954-467-4700. 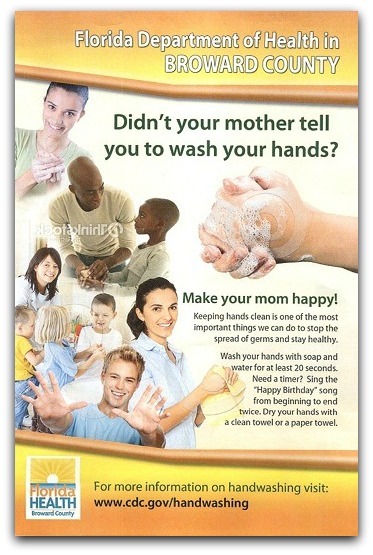 Washing your hands sounds like such a simple thing. But there’s more to it than you think, and what you don’t know could affect you and your family. This is not trivial. Medical research tells us that washing our hands is the number one way humans can help prevent infections and illnesses – and save, literally, a million lives every year. Hand-washing is never more important than in winter and spring. First, flu season in Florida can peak in spring. The virus travels via droplets sneezed or coughed onto the hands. The H1N1 strain of flu has been most prevalent this season, particularly affecting pregnant women and younger adults. Second, it’s social season, when many of us are hugging and shaking hands at events and parties. Third, it’s cruise season, when ships sailing through South Florida may experience outbreaks of stomach infections from norovirus that spreads on unwashed hands. “A little dirt is no big deal.” One trillion bacteria may live in a single gram of feces (the weight of a paper clip). “I’m a clean person. I don’t spread germs.” More than half of healthy people carry staphylococcal bacteria (staph) on their bodies, where it can spread to others. “Fighting off germs strengthens the immune system.” True. But some infections can overwhelm the body’s defenses, especially among the elderly, infants and people with underlying illnesses. “I’m strong. I don’t get sick from dirty hands.” A large percentage of gastrointestinal disease outbreaks that we call food poisoning or the flu are actually caused by unclean hands. 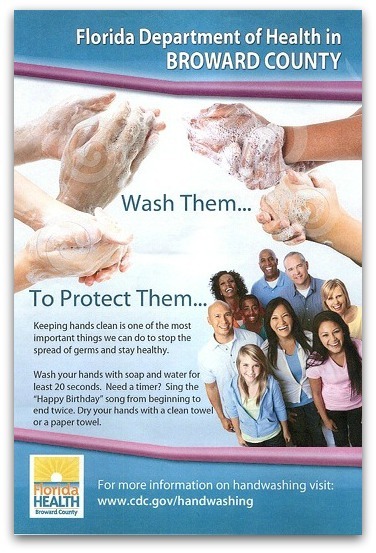 The Centers for Disease Control and Prevention (CDC) encourages hand washing whenever you touch potential contamination. That means before and after handling or eating food, caring for a sick person, tending a wound, using the toilet, changing a diaper, handling garbage, blowing your nose, sneezing, coughing or touching a pet. Please be aware there is a right way to wash your hands and it is important to follow all the steps. Lather vigorously with soap. Don’t skip this step. Soap loosens dirt and makes washing more effective. Don’t forget the backs of hands, between the fingers and under the nails. Scrub for 20 seconds (hum “Happy Birthday” from beginning to end twice). Rinse in clean, running water (not in used wash water). Dry off with a clean towel or air dryer (not your jeans). Wet hands pick up microbes faster than dry ones. A note on hand sanitizers: The popular gels, if they contain at least 60% alcohol, may be handy when washing is not convenient. According to the CDC, sanitizers can quickly reduce the number of microbes, but they do not eliminate all types of germs. Additionally, they lose effectiveness when hands are visibly dirty or greasy. The CDC’s advice: Stick to soap and water when possible. For more information, visit the CDC or call 800-232-4636. WIC in Broward County has gone paperless. The popular Women, Infants and Children program (WIC) that helps families obtain good nutrition has replaced its old system of paper checks with new Electronic Benefit Transfer (EBT) cards that are more convenient for clients to bring to the store. 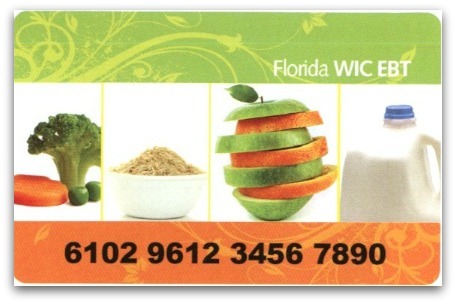 The Broward WIC program made the change to the new EBT cards as part of a statewide project, says Rebecca Hacker, Public Health Nutrition Program Director at the Florida Department of Health in Broward County. All 46,000 WIC recipients in Broward were educated in advance. “People seem to like it very much. 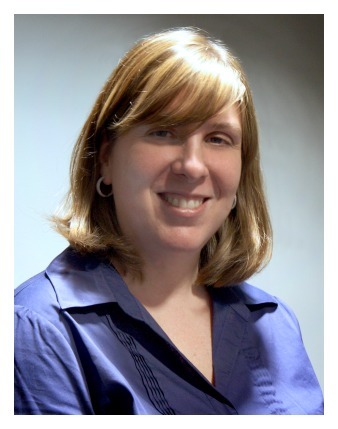 The transition has gone very smoothly,” Hacker says. The EBT cards offer a host of advantages over paper. They save money because client benefits are loaded via computer onto the cards rather than printing checks. They track how much clients spend and how much of their monthly benefit is left to spend. Also, the cards pay only for foods covered by WIC, reducing the chance of mistakes by clients and cashiers. Finally, WIC staffers can become more mobile, able to operate with only a laptop computer, secure wireless service and printer. The federally funded WIC program counsels eligible families about healthy eating for adults, children and babies, and about breastfeeding. The program pays for essential foods such as milk, cheese, eggs, whole grains, fruit juice, cereal, beans, peanut butter, canned fish and fresh produce. The average family’s benefit in Florida last year was $44.39 per month, federal figures show. WIC staff also connect their clients to medical care and other services that women and families may need. Families are eligible for WIC if a woman is pregnant, breastfeeding or has children under age 5, and the family has an income under 185 percent of the federal poverty level (that is $43,568 a year for a family of four). Anyone who qualifies for food stamps or Medicaid will be eligible. Clients do not have to be U.S. citizens, Hacker says. “WIC is highly efficient in Broward, covering more than 95 percent of eligible people,” Hacker says. How do I use it? When the cashier asks, swipe the WIC card like a credit or debit card, and enter your four-digit PIN number. The receipt will include your WIC balance, for easy tracking. What if my card is lost or stolen? Contact WIC at 866-629-1095 to replace the card, which may take time. Safeguard your card. Choose a PIN that you can remember but would be hard for someone to guess. Don’t write your PIN on the card, or tell it to anyone. Keep your card away from direct sun, magnets, cell phones, TVs and microwave ovens. Do I have to buy the store brand? WIC clients must buy the least expensive brand of milk, eggs and frozen juice available in the store at the time. This may be the store brand. Can manufacturer or store coupons be used with WIC? Yes, the store must honor them. WIC has six offices in Broward where people can sign up and receive services. For more information, visit WIC or call 954-767-5111. Fort Lauderdale Health Center | 2421 SW Sixth Ave.
Oakland Park WIC Center | 3756 W. Oakland Park Blvd. Coral Springs WIC Center | 10077 NW 29th St.
DOH-Broward publishes Public Health Broward to inform our partners and contacts in the community. Thank you for being involved. Mission: To protect, promote and improve the health of all people in Florida through integrated state, county and community efforts.